Sun had set and it was getting dark fast, as I drove home. I came around a turn to where the road runs straight for few hundred meters, there I saw two dark images on the road, I quickly realised they were wolves. I slowed down as I got close, the one nearer got off the road and sat down while the other kept its distance on the road. The headlight from the car showed me the details of the beautiful animals, I thought not enough light was there for me to take any photos. After a minute or so I decided to move on, but quickly the wolf sitting, got up and got front of the car. I stopped and it went back off the road, but it was back front of the car when I tried to drive away again. I decided to park the car on the side of the road and see what would take place next. The wolf kept about car length front of my car, with headlights on it, I decided to grab my camera and take few pictures. It kept the same distance while it moved around and also was comfortable enough to defecated on the road. Another vehicle came by and stopped beside mine, I talked with the two in the van as they pointed out two other wolves were behind us, saw one sitting off the road few car length away. They drove away, and the wolves started leaving one by one, I decided to drive off. 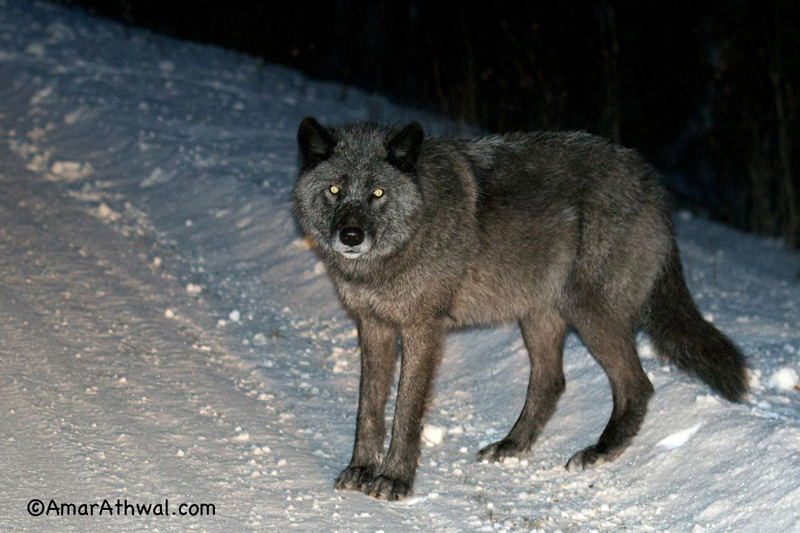 As I did the fourth wolf with a collar around its neck ran across the road front of me. It was great seeing the wolves up close, just hoping they were curious the reason for hanging around the road and were not because they were fed. As one can see from the attached photo, the wolf in it and the other three were in fine health, able to defend for them self. They don't need our food, they just need us to give them space to look after themselves and stay wild.